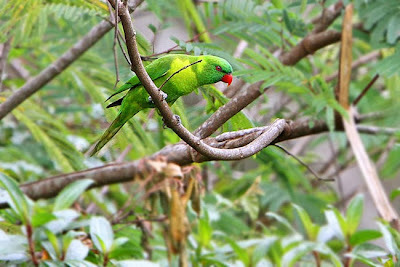 Flores lorikeet Trichoglossus haematodus weberi, photographed by James Eaton. The genus Trichoglossus includes the rainbow lorikeet T. haematodus and related species found in tropical Australasia and the islands of south-east Asia. Members of this genus often have a barred upper breast and/or relatively long tails.